School’s back in session, and that means school zones are back in effect. 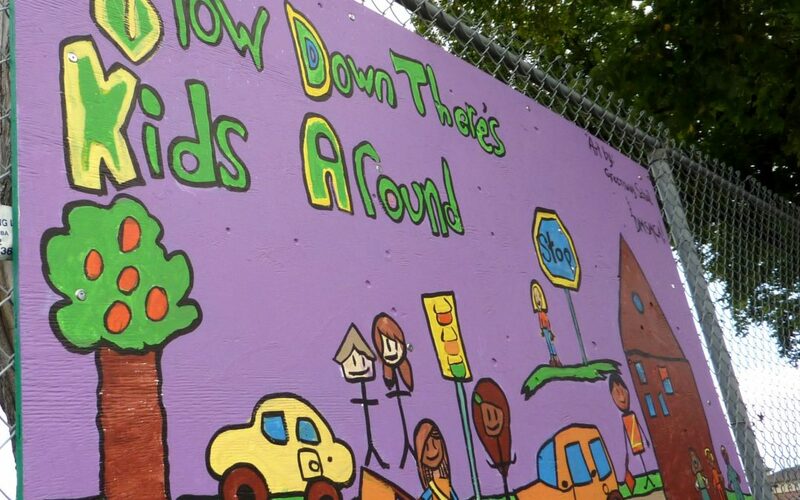 Green Action Centre’s Active and Safe Routes to School Program (ASRTS) wants to remind Manitobans that lowering vehicle speeds can prevent crashes and reduce the severity of injuries sustained in collisions. Pedestrians have been shown to have a 90% chance of survival when struck by a car travelling at 30 km/h or below, but less than 50% chance of surviving an impact at 45 km/h. Children, our most vulnerable road users, are put at an even higher risk of injury and death when vehicle speeds are higher than 30 km/hr. This is why ASRTS supports the enforcement of School Zones and encourages Manitobans to follow suit. School Zones are a contentious topic, and no one likes an expensive speeding ticket. However, we encourage drivers to take a step back from the negative conversations that often surround enforcement in School Zones and remember why we have them in the first place. Whether it’s a school day, holiday, or the middle of summer, we need to respect that we’re driving in areas where people live, children go to school, families play, and people walk, bike, or bus to work. We like to consider them more as full-time “Community Zones”, and as an important intervention to ensure the safety and well-being of people living in the area. The ASRTS Program aims to increase the number of students walking, cycling and using other active modes of transportation for the trip to and from school. This results in a number of personal and community benefits, including increased physical activity, reduced traffic congestion, safer streets and neighbourhoods, improved air quality, and fewer greenhouse gas emissions. A major component of this is working to lower speeds in communities. If families don’t feel confident that their children are safe while walking, biking, or skating to school, they aren’t inclined to let them. The result is that children are less active and less healthy, while more driving congests streets and pollutes the air around schools. This creates a cycle in which fewer and fewer children are on the street and drivers are inclined to move faster because there seems to be nobody around. We need to change this. Many cities across Canada and the world are using reduced speed limits as a tool to make roads safer so that children can use the streets to get around independently. Experience in many countries has shown that when accompanied by sustained, visible enforcement, reduced speed limits and traffic-calming measures that physically change the roadway are effective. We believe Manitobans know that school zones are an important part of the solution, and a necessary intervention to keep children safe. However, we want everyone to see that they are only part of the solution and that we should complement them with changes in road design and an overall culture change that values people using our streets for more than driving. For questions about active school travel please contact us ASRTS@greenactioncentre.ca.